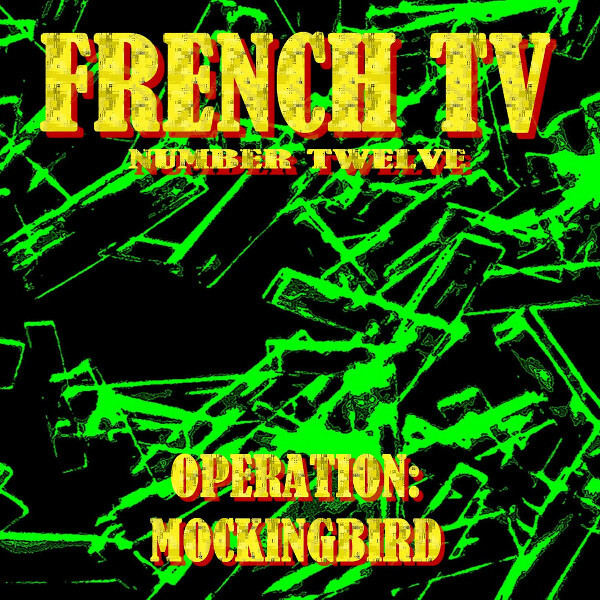 For Operation: Mockingbird, labeled “Number Twelve,” veteran avant-prog band French TV consists of founder Mike Sary with Mark L. Perry (drums) and Katsumi Yoneda (guitar), both of whom are carried over from the last FTV album, along with a set of newcomers: Patrick Strawser (keyboards), Karl Ledus (saxophone, flute), Ludovic Fabre (violin), and Nico Fabre (keyboards on one track). In general, the established FTV sound is intact, with complex instrumental compositions featuring frequent shifts in mood and style, but this outing seems less abrasive and extreme in its juxtapositions. Or maybe I’m just getting more used to this kind of thing. Of the eight tracks here, six are group compositions (Sary, Yoneda, Strawser, Perry) and two are credited to Strawser on his own. At times, the music is reminiscent of Canterbury groups like National Health or Phil Miller’s In Cahoots, though with a strong RIO component along the lines of Thinking Plague. The album is bookended by the two relatively simple Strawser pieces “Ghost Zone” and “Silent Years,” with the effect of packaging up the set tidily and providing boundaries for the more intense and unpredictable middle portion. Strawser’s keyboards, featuring electric piano prominently, act as the base on which the arrangements are build, with sophisticated jazzy chords enhancing the Canterbury vibe due to the similarity with the way Dave Stewart used his instruments. He also contributes some excellent solo moments. Yoneda shines on guitar, whether riffing precisely or flying off on solos. Ludovic Fabre gets a few spots to step up on violin as well, with a particularly notable solo on “Nimrod Dancer.” Sary’s bass and Perry’s drums are the glue holding it all together, changing direction frequently but making it seem logical. In short, this is an excellent addition to the legacy of a band that’s been around three and a half decades, and a great place to start for those who haven’t yet discovered Kentucky’s primary contribution to progressive rock.